Welcome to Integrated Clinical Systems, Inc. developers of Integrated Review & JReview®, the most comprehensive clinical review and analysis software tool in the world. No wonder why so many pharmaceutical companies and government agencies use it. One of JReview's many uses is as a clinical data review environment. It provides an intuitive user interface to perform the tasks required to conduct safety and efficacy review through clinically relevant reports and data visualizations. The Professional Services Department is here to help in any way we can to make your implementation a success. We can perform consulting for implementation planning, installation and configuration, IQ & OQ, best practices, gap analysis, training, etc. Do You Need to Review Clinical Data? developed specifically for reviewing clinical data. JReview objects can now be created in a newly designed drag-and-drop user interface providing immediate preview of results. 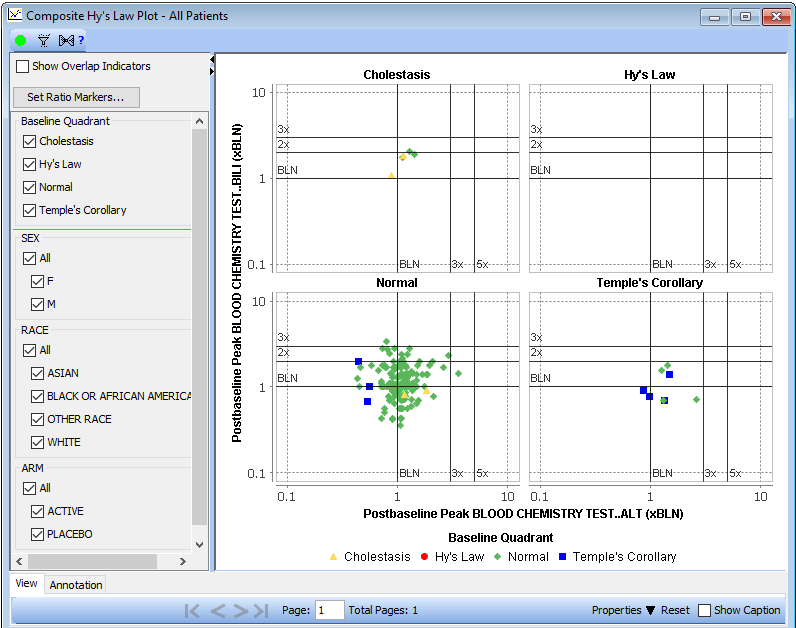 To define a new object - just drag panel items onto a graph, report, or crosstab to set axes and by-variables, or to add legends and dynamic filter elements for safety experts to define patient characteristics. Each of these definition areas display previews of the output for further refinement before saving and sharing the object definitions, as well as publishing them as a dashboard at project or study level. In addition to the ‘classic Hy’s Law plot’, which was already included in JReview, we’ve added a new graph type which includes initial categorization of each patient at baseline regarding their position in a Hy’s Law chart, then plots each patient’s peak values as the ratio of the peak value to the patient’s baseline value on a composite graph for each of the 4 possible liver injury states – Normal, Cholestasis, Hy’s Law or Temple’s Corollary, with color coding based on the legend as to their baseline condition.